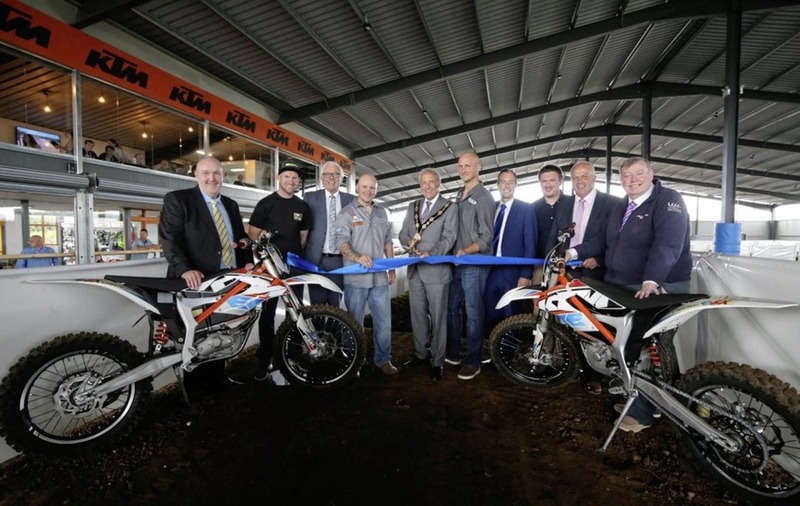 Pictured at the official opening of E-Trax in Moira alongside the Mayor, Uel Mackin are: William Leathem, chairman of the council's development committee; Martin Barr, British & European Championship Motocross contender; Allan Ewart, vice-chair of the development committee; Kyle Rainey and Gareth George, E-Trax owners and directors; Paul Givan MLA; Cllr Scott Carson; James Tinsley and Paul Porter, chairman of the council's leisure & community development committee. IRELAND'S first indoor electric motocross track has opened in Moira following a £400,000 investment. 'E-Trax' , brought forward by company directors, Kyle Rainey and Gareth George is now open and the 35,000 sq ft facility offers children as young as five years old, teenagers and adults the off-road experience of motocross indoors. Officially opening the business, the Mayor of Lisburn & Castlereagh City Council, Uel Mackin welcomed the addition to the local tourism and leisure market. "E-Trax uses pioneering KTM Freeride E bikes, which do not produce noise as they lack gears and a clutch, making them environmentally friendly too; and the use of this type of bike means that the Lisburn Castlereagh area has Ireland's first certified KTM e-park." "E-Trax offers a fun, safe and controlled environment for people to participate in the motocross sport. The two tracks within E-Trax can accommodate both those new to the sport and those familiar with motocross bikes. “I am confident that this new attraction will be a great success and will have many residents and visitors through its doors."